Home / Eye Care / Comprehensive Eye Exams for Adults: What Do They Entail? Having regular eye exams is the single best thing you can do to safeguard your visual health. Many of the most serious eye conditions are asymptomatic in the early stages, making them impossible to detect without an eye exam. 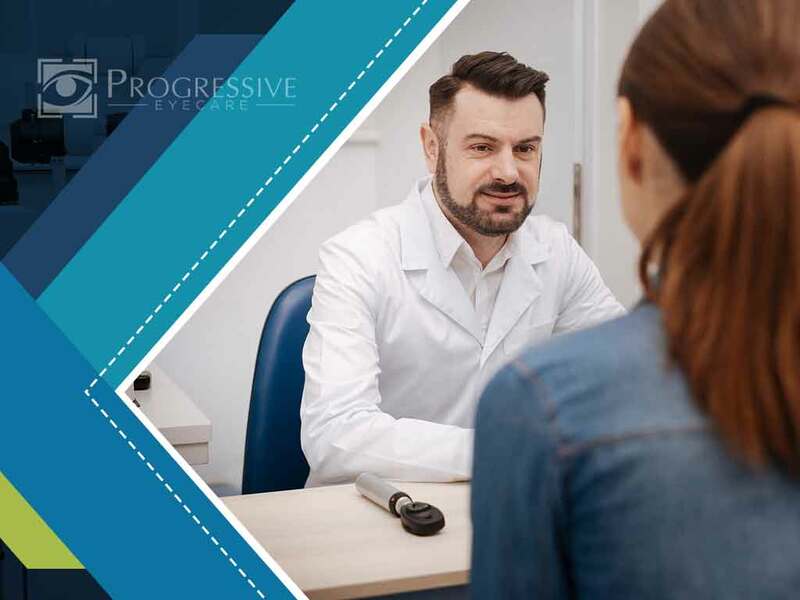 In today’s post, Progressive Eyecare, a leading provider of eye care services, explains what to expect in a comprehensive eye exam for patients over the age of 18. An adult eye exam is more than just about learning whether you need new eyeglasses or contact lenses. As a whole, it’s an interactive process with the goal of assessing the health and function of the eyes. Your eye doctor will also look for the presence of other systemic or ocular health conditions that may exist without symptoms. Based on the findings, your doctor will provide a diagnosis and treatment plan designed to manage any vision errors or underlying eye conditions. A typical adult eye examination involves a sequence of procedures geared toward providing your eye doctor with a complete assessment of your overall visual health. At the beginning of the exam, your eye doctor will ask you about your personal and family medical history. You will be asked to provide important information regarding your visual health as well as your overall health. Your doctor will want to know about your medical history, your family’s eye and medical histories, vocational and avocational vision requirements, and medication usage. This part of the eye exam presents an opportunity to establish a doctor-patient relationship. The next procedure involves testing the sharpness of your vision. You’ll be asked to identify numbers or letters on a standardized eye chart while standing at a certain distance. If you have eyeglasses or contact lenses, you may be asked to take the test while wearing them. Depending on the information obtained during the first part of the eye exam, your eye doctor may conduct another series of tests. This may include a general observation of your overall appearance, including your eyes and facial areas. Your pupils may be tested to see how they respond to direct light. Preliminary testing may also include other procedures like cover tests, stereopsis and color vision tests. These are important to help your eye doctor assess the alignment of your eyes, eye coordination that enables normal depth perception, and potential color blindness. In this phase of the eye exam, your doctor will integrate the analysis of your refractive error with both an objective and subjective assessment of your vision correction needs. During this part of the exam, the curvature of both your eyes’ corneas will be measured through tests like keratometry and corneal topography. Both tests are looking for signs of astigmatism, a condition where one of or both your corneas is irregularly shaped. These tests are checking to see if both your eyes are able to change their focus from near to distant objects and vice versa. Ocular motility tests assess how well your eye muscles work to ensure movement. Binocular vision tests examine how your eyes are able to discern overlapping fields of view. These functional aspects of vision are interrelated and are critical in providing clear, comfortable vision for performing tasks like reading and other close-range work. During this important component of the comprehensive eye exam, the eye doctor will assess whether you have a primary or secondary ocular disease. Primary eye diseases are those that originate in the eye, while secondary diseases could be neurologic, vascular, endocrine or immune in nature. This part of the test contributes to the diagnosis of underlying eye diseases and helps determine the impact of systemic diseases like ocular hypertension. A notable test in this phase measures intraocular pressure (IOP) in the eyes. A high IOP result is an indicator of glaucoma, one of the leading causes of blindness across the country. Depending on the results of the previous tests, further assessments are sometimes needed. These can be done either immediately after eye exams or at a subsequent date. Apart from ruling out or confirming various diagnoses, these tests may also serve as an alternative means of evaluating the patient. Once completed, the optometrist creates a diagnosis (or diagnoses) based on the assessment and evaluation of all data collected during the exam. From there, a treatment plan will be designed. In other instances, the doctor may refer you to another optometrist for additional eye exams, your primary care physician or health care provider for consultation or treatment as needed. For your optometry needs, turn to Progressive Eyecare. Even if you don’t feel like anything is wrong with your eyes, it is still important to have them checked regularly. Undergoing regular eye exams gives your optometrist an accurate picture of your current visual health and allows for early detection of underlying diseases or conditions.